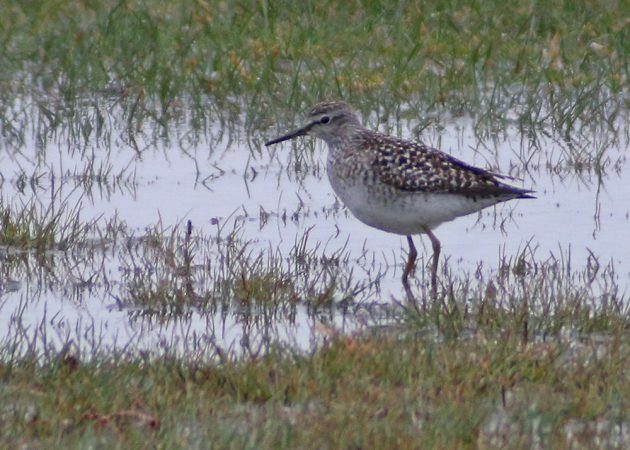 A couple of weeks ago a group of New York’s better birders were out birding in Suffolk County when one of the four found an interesting shorebird, one which she couldn’t identify immediately. 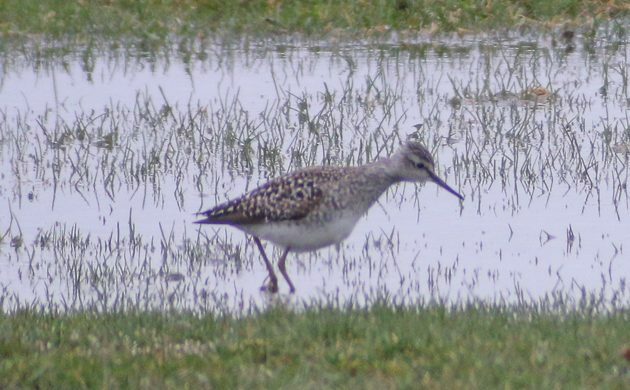 For Pat Lindsay to not know what a shorebird is when she spots one in New York State is a very unusual occurrence and her three fellow birders quickly convened, figured out the bird as a quartet, and got the word out to the birding hordes. 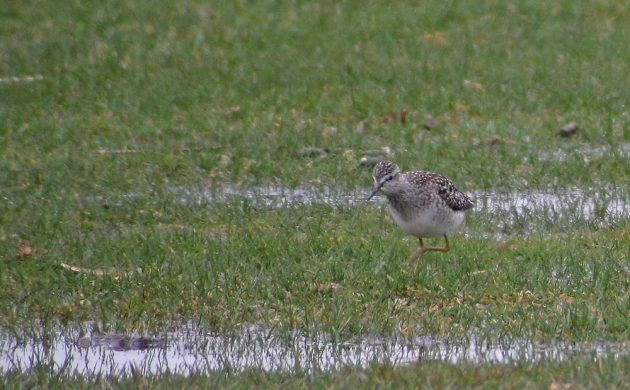 The bird, a Wood Sandpiper, was still present the next morning and I made a quick run out to Timber Point Country Club where the bird was regularly foraging in a flooded field, to see if I too could get lucky enough to add New York’s second-ever Wood Sandpiper to my state list. I drove up, parked my car, walked up to the very extensive scope line, and spotted the bird. Easy peasy, the best type of twitch! My first Wood Sandpiper since 2009. The ones in 2009, the only previous Wood Sandpipers I’d ever seen, were in Kazakhstan. About two minutes after my arrival the bird was spooked by a flyover Osprey and it took off with some yellowlegs. Fortunately, it came back relatively quickly, gladdening those who had arrived in the intervening few minutes. This time I got to watch it for a bit longer and appreciate it a bit. The next time the sandpiper took off, about ten minutes later, we all waited around some more. And waited around some more. And waited around some more. More birders arrived. Search parties combed other parts of the golf course and the nearby marshes. But the bird was not found again that day or any subsequent day. New York State’s second Wood Sandpiper was a sixteen-hour-wonder, with most of that time being the overnight hours. I’m just glad I was able to act quickly and see this bird though I’d be lying if I said it was stunningly beautiful or even particularly interesting. What is was is new for my state list andan interesting mystery in terms of how it managed to show up on a flooded field at a golf course in New York State in April and get found by one of the relatively few people in the state who would realize it was something amazing. Sweet, and your right, most of my “Twitches” have not gone that smoothly!